See the ribbon/paper banner extending to the left? The paper is actually a tag from my daughter's pants. I trimmed it down, and laid a satin ribbon over the wording. It's nice to repurpose something as pretty as this! As for the heart on the sketch...I don't have a heart shaped die, so that was out for me. Guess I could've used a heart-shaped stamp, but that thought did not cross my mind until I was finished. Instead, I clustered some chipboard heart stickers from K & Co on a Spellbinders tag. The edges of the card are inked with Tattered Rose Distress Ink, and a sweet Verve sentiment is a good one for Valentine's Day, I think. I'm entering this at CARDS create: blog for the new challenge, to use at least 6 hearts. I've got waaaay more than 6 if you count the embossing folder! I apologize for not getting around to everyone's blog for a visit. I am experiencing pain in my hands, mostly my right (which is the "mouse" hand). I had x-rays taken this morning, and am awaiting results. After doing some research online, I believe it might be rheumatoid arthritis. (great.) My hands are starting to resemble my grandmother's, however, I'm only about half the age she was when her hands looked this way. I am seriously bummed. The knuckles right under my fingernails are swollen, tender and painful. The pinkie finger is stiff sometimes, and hurts to bend. Like I said, I am seriously bummed. So...when my hands have good days, I will make my way 'round to all of you, because I enjoy seeing what you have created! Other: Big Shot; 'Love is in the Air' embossing folder - Cuttlebug; Oval and Fancy Tags Three dies - Spellbinders; ribbon; pearls; stickers - Valentine's Day adhesive chipboard stickers - K & Co.
Love the recycling! And that die cut is gorgeous! Hope your hands feel better soon! It's a struggle I know! I have old lady arthritis and my hands are a nightmare- especially in the winter! Pretty card! So sorry about your hand! Hopefully they can do something to help!! Have a great week end! I am praying that it's not RA. Positive thoughts your way!!! I just love your upcycling Colleen! Seriously a tag from Hollister, but I can see why!!! Poor you; please don't apologise for not being around. Your health comes first and what you described sounds really awful... I keep my fingers crossed that the results of the X-ray are not as bad as the signals that you are experiencing right now. Take care. A big hug from Holland. After reading your post I am even more impressed by this amazing card. You made while you're not feeling well. And the result is jaw dropping. I love the way you repurposed the tag of your dauhters'pants and that Spellbinder tag with the heart; ahhhh!!!! Gorgeous card Colleen! Take care; thinking of you and sending love and hugs.. It's a beautiful card, Colleen and I love the variety of heart stickers you used. Wow Colleen. This is gorgeous. Nice job on repurposing that tag! 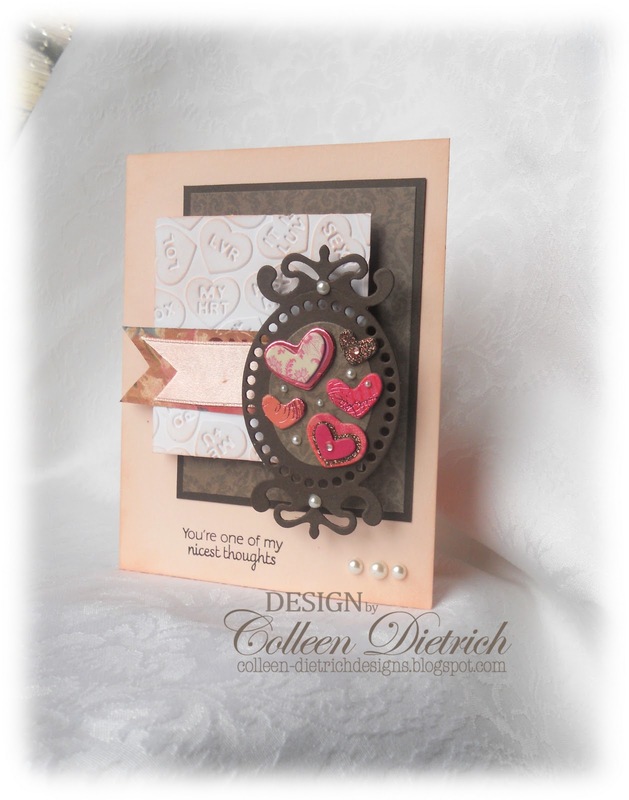 Such a pretty card Colleen, love the embossed conversation hearts! Sorry to hear that your hand is sore...hope they can help you. Lovely card as always, I need to check out that sketch, I love it! Feel better. Fabulous take on the sketch, Colleen :) Well done on using the tag too. The fancy label is perfect and love the hearts. This is lovely, and what a great way to repurpose that tag! I am so sorry to hear about your hands...hope you find some relief! How beautiful, Colleen! I love that changed out the heart in the sketch for that beautiful label with those pretty hearts!! Genius :). I'm thinking of you and keeping my fingers crossed that the Xrays don't show anything that can't be fixed easily. Take good care of yourself!!! Well aren't you the clever one!!! I love what you did with that tag. This card had the greatest layout. It fits your style to a "T". This is absolutely gorgeous. Gorgeous card, Colleen! Love the frame and little hearts! Great creative way to recycle from daugher's tag! Am sorry to hear about your hands. I hope they improve! I get it in my right hand at times. So, I have to pace myself. Anyways, I truly hope your hands get to feeling better. Sending warm thoughts and hugs your way, take care, Colleen! Hugssssssss!!! Take care of yourself Colleen-I pray God heal you and guide you on ways to control it. OHHH! Col--this is super beautiful! I LOVE the embossing and the colors of the heart and your background paper! GORGEOUS! Beautiful details too--love! Awesome! This is a real beauty!!! Fabulous Colleen! 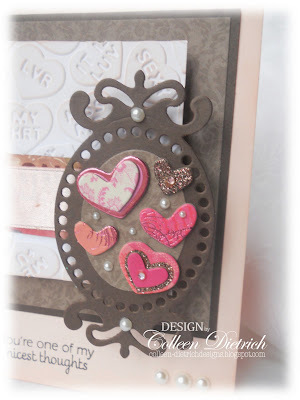 Love the Fancy Tag die cut with the fabulous hearts in the center! Love the colors and the texture! Awesome take on Teresa's sketch! Another stunning card my friend.. I am so sorry to hear about you hand.. I do hope it's not to serious.. This is beautiful Colleen, love the fancy label, and pretty colour combo! So elegant! A beautiful Valentine, Colleen! Love that repurposed tag and all the little hearts. Gorgeous colors and love all that texture! The tag with the hearts on it is perfect! So sorry about your hands! I hope you find some relief and hope the answer is not no more blogging! Way to use what you've got, girl! That tag is the perfect touch, and congrats on it being featured over at CARDS!